You can change the background color of a Microsoft Word document (for Mac) to any color you want and print it. Follow these steps (latest version of Microsoft Word). Select Page Color and a color to apply to your Word Document. 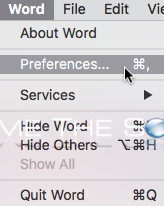 Go to Word -> Preferences. Under Output and Sharing select Print. Ensure Print background colors and images is checked. Now, you can print the color background you just set for your Mac Word document!